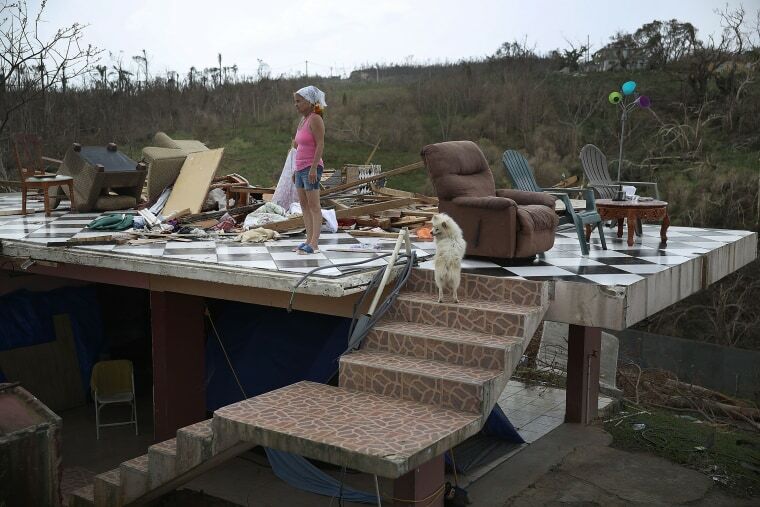 The White House announced Thursday that it had waived the Jones Act — a nearly century-old shipping law many have said is hampering relief efforts in hurricane-ravaged Puerto Rico — to allow much-needed goods to arrive more quickly to the island. “At @ricardorossello request, @POTUS has authorized the Jones Act be waived for Puerto Rico. It will go into effect immediately,” the White House press secretary, Sarah Huckabee Sanders, tweeted Thursday morning. Puerto Rico Gov. Ricardo Rosselló had tweeted earlier that he’d petitioned the White House Wednesday night for a temporary waiver, which would allow foreign ships to deliver items to the island. The acting Homeland Security secretary, Elaine Duke, confirmed the move, saying that the temporary waiver will last for 10 days and covers all products being shipped to Puerto Rico. "It is intended to ensure we have enough fuel and commodities to support lifesaving efforts, respond to the storm, and restore critical services and critical infrastructure operations in the wake of these devastating storms,” Duke said in a statement. President Donald Trump had come under increasing pressure in recent days from officials in Puerto Rico and the mainland concerned about the island, which is running dangerously low on fuel, clean drinking water and other critical supplies after being devastated by Hurricane Maria. The Jones Act, otherwise known as the Merchant Marine Act of 1920, requires goods shipped between American ports to be carried exclusively by ships built primarily in the United States, and to have U.S. citizens as its owners and crews. Related: What is the Jones Act? Signed into law by President Woodrow Wilson two years after World War I ended, it was passed as a protective measure against foreign competition, particularly Germany. The law has since found backers in the American maritime industry, which says it supports American jobs. Recent presidents from both parties, including George W. Bush and Barack Obama, have touted it as crucial to national security because it reduces America's dependency on foreign-owned vessels. But opponents argue it's an anachronistic piece of legislation that unnecessarily raises the cost of imported goods for the island economy of Puerto Rico. They say Puerto Ricans, who depend on imports, absorb extra shipping costs for items that could be shipped directly from American ports to Puerto Rico with readily available foreign crews, but instead must be delivered by U.S. flagged vessels. The waiver was met with praise from those who'd voiced opposition to the law. "Trump admin has finally waived #JonesAct for #PuertoRico," Sen. John McCain, R-Ariz., who had urged DHS to waive it on Tuesday, tweeted. "Now Congress must repeal this law to aid long-term recovery." Later Thursday, McCain, along with Sen. Mike Lee, R-Utah, introduced legislation that would permanently exempt Puerto Rico from the Jones Act to help with hurricane recovery efforts and to "encourage long-term economic growth." Hallie Jackson and Elizabeth Chuck contributed.